My dog, Baby, is probably a lot like your canine companions. She has ready and regular access to nutritious food, and yet, no sooner do we leave the house for our walk than she turns into a goat. Our lawn, the neighbors’ yards or tufts of grass growing along the forest trails: Baby samples a bit of each over the course of an outing. It is among the most common and puzzling things dogs do. 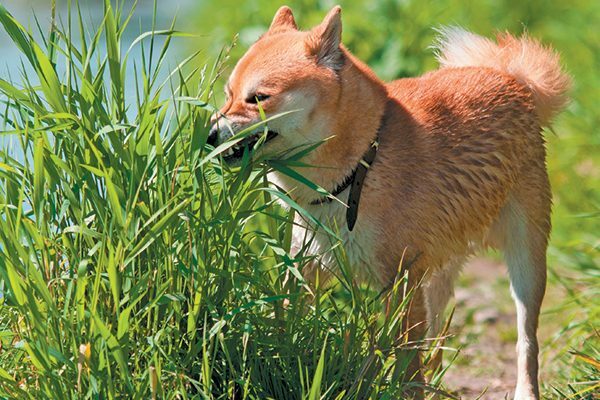 Is your dog eating grass? Read on! Does your dog eat grass? Here’s why and here’s how to deal with it. Photography by irontrybex/THINKSTOCK. Do dogs eat grass to help them vomit or poop? Folk wisdom suggests that a dog eating grass can ease digestive issues at both ends, encouraging dogs to throw up and help to move poop through their colons. Science offers no evidence linking eating grass with vomiting. It has shown that dogs, already nauseated before grazing, were more likely to throw up after. The same goes for the supposed laxative properties of grass. When a dog is getting mostly meat-based proteins, fresh water and consistent exercise, digestion takes an average of four to eight hours. Since a dog’s body isn’t built to break down plant matter, grass actually hangs around longer. Is your dog eating grass because it’s a dietary supplement? Are there nutrients in grass that a dog needs? This timeless gem is used to explain every taste oddity, from eating dirt to the taste for poop. Is grass the one true superfood? Before getting your pupper certified as a dietary specialist, remember that dogs are also known to eat underwear, rubber duckies and loose change. So, the answer is no. Animals whose diets depend on grasses and grains, from cows to humans, have longer digestive tracts than those who rely on proteins, like dogs and cats. If you feel that your dog’s diet is missing something, it’s not grass. Remember, suddenly switching your dog to a different food or adding concentrated supplements is the quickest way to cause stomach upset in dogs. Do dogs eat grass because of their ancestors? Another persistent notion is that our dogs eat grass because their distant ancestors did. The idea is that wolves developed an appreciation, both for the animals they ate and for whatever remained inside their prey. By this logic, because I enjoy chicken meat, I should also crave worms and dried corn. I’ll keep you posted! Dogs are opportunistic omnivores who can and will eat anything, regardless of nutritional value. If yours is an indoor dog, she might eat grass out of simple curiosity. More outside playtime, along with increased exposure to grasses, might make it less appealing, though I admit it’s had no effect on my own dog! Do dogs tend to eat certain kinds of grass? Is your dog throwing up or pooping after swallowing some fescue or crabgrass? Look to the grass itself for an answer, not the dog. Do you, your neighbors or the park maintenance staff treat grass with herbicides or fertilizers? Wind and rain can easily carry landscaping treatments far beyond the turf it’s meant for. Nearly half of the dogs in one study had traces of lawn chemicals in their urine, despite living in homes with untreated lawns! Waste left by dogs, birds and other wildlife can also attract a dog’s nose and tongue and affect normal digestion. Some people try to discourage their dogs from eating grass by stopping less frequently during walks. Others have started cultivating pet grass, which their dogs can nibble on without fear of toxins or additives. The strangest effect that a dog grass eating has is on dog owners. We may never know why dogs eat grass, but the mental gymnastics we perform trying to justify it to ourselves are more entertaining than the habit itself! Melvin Peña is a writer, editor, social media manager and SEO specialist who spends most of his time in Durham, North Carolina. His interests include his dog, Baby (of course! ), art, hiking, urban farming and karaoke. The post Why Is Your Dog Eating Grass? 4 Reasons appeared first on Dogster.